Coffee Shop: The 24-hour Coffee Shop serves wide range of snacks, salad, appetizers, desserts etc. with wide range of alcoholic and non-alcoholic beverages. 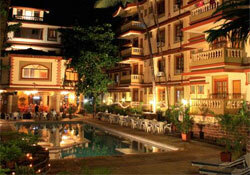 Highpalm: The Multi-cuisine Restaurant with live entertainment of songs, Folk dances, and well stocked bar. Gulzar: The Indian Dining Restaurant with live entertainment of Ghazals and Indian classical music and dance. The Gulzar caters to your individual taste buds and the friendly staffs are ever ready to explain the finer culinary details of the authentic Indian menu. Food Bazar: The Snacks Counter serves you quick bites when you are sitting by the poolside, with the choice of your Cocktails and Mock tails. Cheers: Sports Bar is the latest concept of play while you drink. While our barman fixes a sporty drink of your choice, you may play Darts or enjoy a quick game of Pool, Carom or Chess. Room Facilities: King and Queen size beds, Complimentary newspapers in the rooms, Mini bar, In-house movies and satellite channels, Direct dialing STD/ISD, Hair dryer (on request), Writing & coffee tables and every room has private sit-out balconies.